Why should you help Christopher in his fight for justice? --Christopher is innocent. This is the most important reason to help Christopher in this battle. Since 1973, 102 people in 25 states have been released from death row because they were proven to be innocent, including four this year (2002). Click the link below for graphics. --The death penalty is applied unfairly. The facts show that the less money you have, the more likley you are to be given a death sentence. --The death penalty is racist. The race of the defendant is often a factor in determining whether or not the death penalty is given. The race of the victim is also a factor. Click on link below for more data. --The death penalty is immoral. More than 30 religious organizations have official statements opposing capital punishment on various moral and humanitarian grounds. 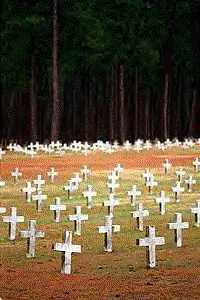 Graves of Texas death row prisoners.